Distribution of polystyrene latex (PSL, yellow-green, 200 nm diameter) particles on Transwell® inserts after 0.5-h exposure in NACIVT: Left/Upper: Laser scanning micrograph shows the uniform distribution of deposited PSL particles. 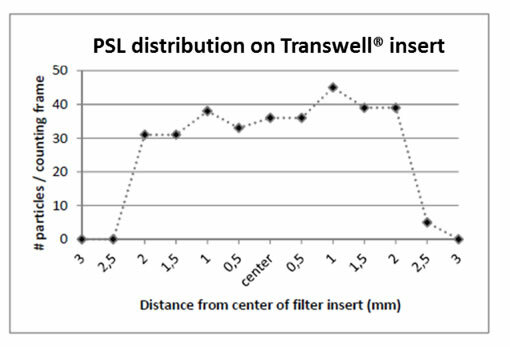 Right/Lower: The graph showing deposited particles as a function of the distance from the center of the Transwell® membrane demonstrates even distribution of PSL particles over the insert membrane except for the outermost zone, where considerably fewer particles were deposited. Read more (Jeannet et al., Nanotoxicology 9(1):34-42 (2015), DOI: 10.3109/17435390.2014.886739). 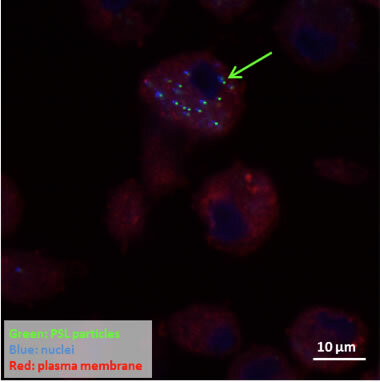 Deposited particles reach the cells: Laser scanning micrograph showing uptake of green fluorescent PSL particles (yellow-green, 200 nm diameter, arrow) by macrophages after 1-h exposure in NACIVT (Jeannet et al., Nanotoxicology 9(1):34-42 (2015), DOI: 10.3109/17435390.2014.886739). 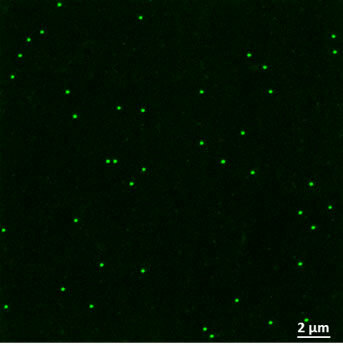 NACIVT is suitable for use with cell cultures. 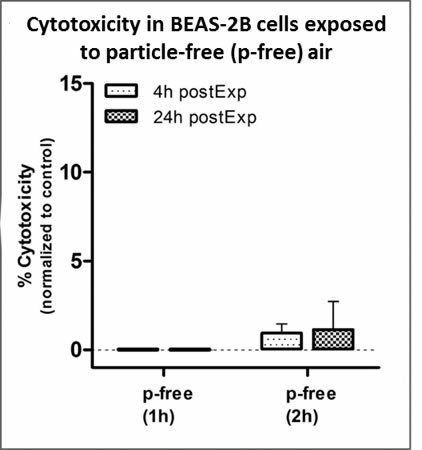 For example, exposure of BEAS-2B cells to particle-free air does not increase necrotic cell death (% cytotoxicity) (Jeannet et al., Nanotoxicology 9(1):34-42 (2015), DOI: 10.3109/17435390.2014.886739). Cultures of fully differentiated normal and cystic fibrosis (CF) epithelia were exposed to three different concentrations of silver nanoparticles (AgNP) during maximally 1 hour. 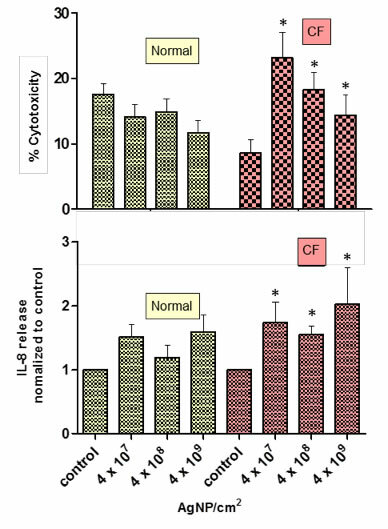 Cell analysis at 24 h after aerosol exposure revealed that CF epithelia responded more sensitively and at all doses to NP exposure than normal epithelia. 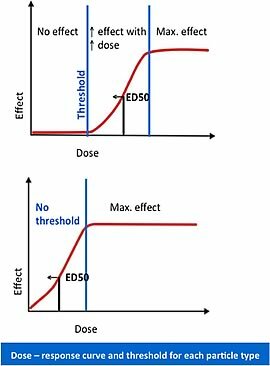 For example, necrotic cell death (% cytotoxicity) as well as interleukin-8 (IL-8) release were significantly (*p < 0.05) increased compared to control values in CF but not in normal epithelia (Jeannet et al., Nanotoxicology, 2015, DOI 10.3109/17435390.2015.1049233).